A seminar led by Myles F. Elledge, Executive Director for Health and the Environment with Biomass Controls LLC, on the global challenge of providing urban sanitation services and how new technology approaches may contribute to better sanitation containment and treatment. Population demographic trends in the developing world show rapidly growing urban populations and the exploding geographic size of its urban areas. This rapid growth is causing the gap for under-served with unsafe sanitation to continue to expand. And while access to toilets is growing in many areas, sanitation treatment lags far behind. Continued focus on centralized sewerage systems and simple on-site sanitation appear to be not timely, technically feasible or financially viable given projected urban growth patterns. The global challenge of providing urban sanitation services in emerging market’s urban areas highlights the need to change the paradigm for sanitation planning and service provision. International research teams are in the midst of an innovation drive for the development of leap-frog technologies that change the paradigm for waste treatment to be on-site, with decentralized treatment approaches delivering effective treatment, reduced input requirements along with resource recovery elements. 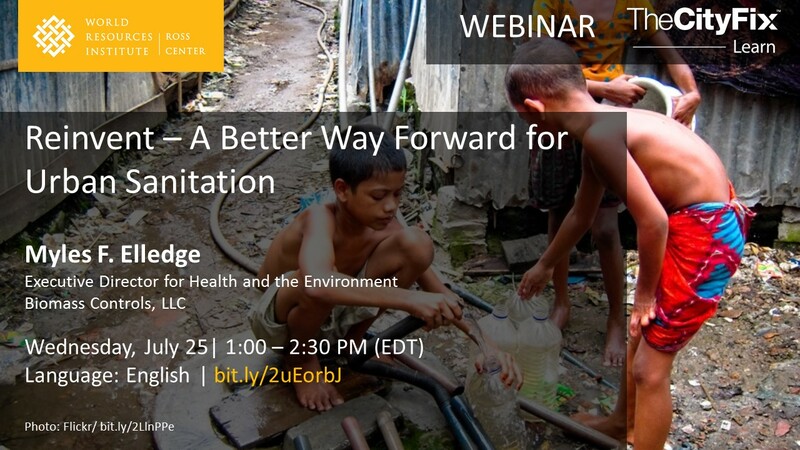 This presentation draws upon the Bill and Melinda Gates Foundation’s "Reinvent the Toilet Challenge" technology development portfolio to reflect on how new technology approaches may contribute to better sanitation containment and treatment, and where policy measures will be important to enable technology adoption. Myles F. Elledge is the Executive Director for Health and the Environment with Biomass Controls LLC. Myles has 28 years of experience in development policy and planning in over 30 developing markets. He has a passion for environmental health and is active in technology innovation and adoption initiatives in water, sanitation and clean energy.